Forgive me if I’m wrong, but I can’t see a thread on the Irish Times’ “crane watch” which was commenced last year. 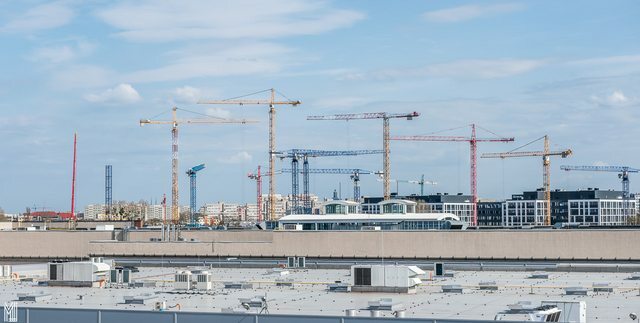 There were 60 construction cranes visible over the centre of Dublin on February 1st from the seventh floor of The Irish Times building on Tara Street. This is an increase of two – or 3 per cent – on December’s total of 58 and a rise of 26 (or 76 per cent) on the 34 cranes recorded on February 1st, 2016, when The Irish Times crane survey was first launched. An interesting one to keep an eye on, they post a monthly count. For the sake of context and comparison, anyone know if there are any documented numbers of cranes prior to previous crash available? I have searched google archived news, but couldn’t find any references. The number of cranes is only going to rise over the next 2 years particularly in the north docklands. There was a thread ( I can’t find) on the number of idle cranes around the city duringthe bust. Yeah, I had a laugh about that too. God forbid there might be a crane down in Cork or in Galway. Yes typical example of Irish Times and R.T.E. South County Dublin short sightedness.